Say you've been struck with back pain, the kind that seems to be getting in the way of everything. It's an extremely common scenario. The National Institutes of Health estimates about 80 percent of American adults will experience lower back pain at some point. It might mess with how well you sleep or your ability to sit upright in a desk chair during the work day. Or the pain might lead you to put a pause on your usual workout routine in attempts to keep it from getting worse. But experts stress the importance of staying active. 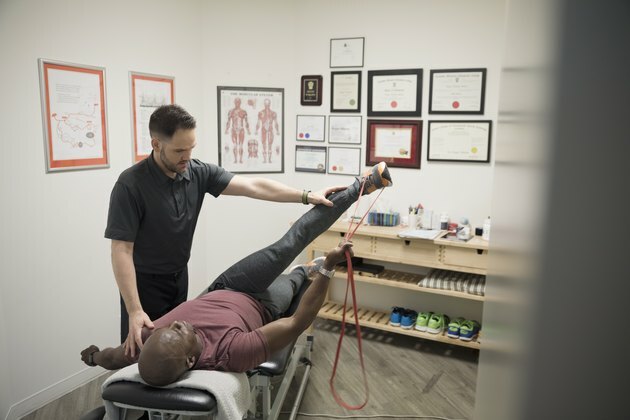 "Care needs to be taken to ensure that load and range are modified, but movement is therapeutic and necessary for rehabilitation," says Chris Reinbold, a California-based physical therapist. In fact, weak muscles in your back or core may be the reason for the pain in the first place. It may seem counterintuitive, but staying sedentary could make the pain even more intense, says Adam Fritsch, an Illinois-based physical therapist with Athletico Physical Therapy. Bed rest could also contribute to other issues, including depression, muscle loss, and blood clots in the legs. If you feel you need to give your body some time to recover from the injury, do so, but limit it to no more than two days, Reinbold says. "Once past that point, movement and exercise is necessary to return to your prior activity level," he says. First, don't expect to jump right back into where you left off. Easing back into your routine is a good rule of thumb, Fritsch says. You'll want to be mindful about how you're moving and don't move in a way that makes the pain worse, he says. Forget about going for high weight or high reps, Reinbold says. During this post-injury period, you'll want to zero in on what Reinbold calls "low level" things, such as hip and spinal segmental mobility and control. Your ideal workout should be a mix of building strength, flexibility and aerobic fitness, according to a 2016 paper published in Healthcare. Additional muscle strength will support your spine, increased flexibility will benefit your range of motion and cardio will increase blood flow to the back, which can promote healing and reduce stiffness, according to the paper's authors. Frisch recommends starting your workout with a 10- to 15-minute cardio warm-up that elevates your heart rate. "Once the body is warm, exercises moving forward will become easier," he says. Your doctor may recommend exercises for you to run through on your own. Or if you're the type that needs more direction, physical therapy is another option that can arm you with the confidence and knowledge you need to get back to the gym. "Physical therapists can also answer specific questions about pain and offer a personalized 'return-to-workout' plan," Fritsch says. The types of movements you should and should not do depend on the injury and the type of back pain you're experiencing. While the recommendations below can help people with mild or moderate back pain, know that the type of pain you're experiencing is unique to you and every patient responds differently. If you experience pain anywhere besides the back, such as pain that runs down the leg or numbness and tingling elsewhere on the body, be sure to see a physical therapist or a doctor for an evaluation before jumping into these movements, Frisch says. 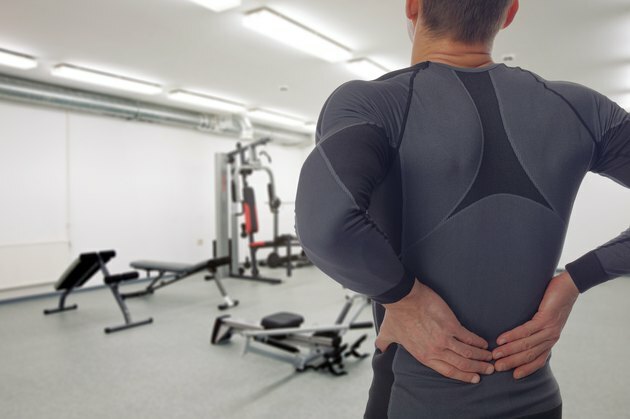 With mild or moderate lower back pain, no specific movement is off limits, but you should pay close attention to how your body responds to the exercise and modify if things feel off. Not sure where to start? Try deadlifts. Research shows the move can relieve pain and increase activity. One study published in 2015 in the Journal of Strength and Conditioning Research found this is mainly true for patients who have solid back extensor muscle strength and endurance as well as a low pain intensity level. Reinbold recommends moves that focus on hip mobility and thoracic spine mobility, such as the Brettzel, 90/90 sitting and squatting with active hip external and internal rotation. Breath work is also important. Try Reinbold's exercise: Place your pointer and middle fingers just inside the hip bone and thumbs in the soft spot between your hips and ribs. Breathe into your fingers and toward your pelvic floor, keeping your chest from rising too much. Think about breathing to expand your trunk in all directions rather than just forward and back. As you exhale, try to maintain the pressure you've created. For mild pain, focus on strengthening the posterior chain, which is made up of the muscles found along the back of the body, Frisch says. Try rows, overhead presses, lat pulldowns and deadlifts, he says. In addition to strength training, you'll also want to work on mobility to help you feel better as you move, Frisch says. Try child's pose and pectoral stretches to help here. Before you head back to the gym, focus on nailing everyday movements, such as bending over to tie your shoe and putting your socks on, Frisch says. "Once you feel like you can resume the day-to-day motions, you can move back to the gym," he says. The approach here is similar to that of a pulled back muscle: Start with the everyday movements — such as squatting and bending — before you tackle weight training, Frisch says. Low-intensity exercise three times a week during the second half of pregnancy has been shown to alleviate pain, according to a 2008 study published in Current Reviews in Musculoskeletal Medicine. Other exercises that may help include pelvic tilts, knee pulls, straight leg raises, curl ups, lateral straight leg raises, Kegel exercises and water aerobics. You may also benefit from a good stretching session filled with stretches designed for pregnant women. Frisch says many pregnant women can safely continue their pre-pregnancy workouts but adds it's a good idea to get clearance from a doctor first.